Being a new mum is a complex thing. You have to navigate a maze of information and advice, whilst trying to understand your child, and attempt to do what is best for them and for you. One of the biggest and hottest debates on the parenting circuit is how to feed your baby! Which is better? Which is harder? Which is going to cause the least amount of pressure and stigma? The thing is you’re kind of in a catch 22 situation. No matter what you do, someone is going to have a different opinion to you. Breastfeeding is great,until you do it in public and then Bob thinks it’s wrong and distasteful. So you formula feed, but Jill is disappointed that you aren’t breastfeeding because it’s ‘better for baby’!! It’s a lose lose situation!! I started out breastfeeding – three weeks exclusively – but decided to wean to formula because I was struggling on a mental level (you can read about the decision here). Over the course of seven weeks we gradually replaced breastfeeding sessions with bottle feeds until at 10 weeks Henry was fully formula fed. And it works for us. It really does. And we haven’t lost that special bond, but it does mean Dann can help out. Unfortunately there isn’t a lot of advice out there for formula feeding mums, especially for those that start breastfeeding and decide to move on. 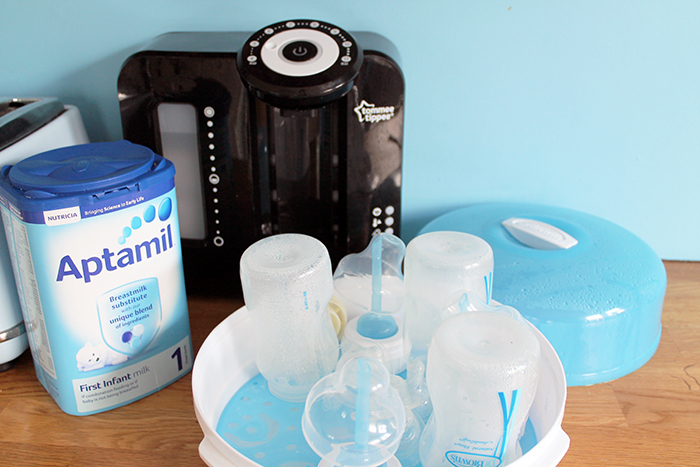 From my experience I thought I’d share a few little pointers for weaning and working with formula. I found that replacing a feed every few days worked best for me as my breast milk supply was fully established. I really wanted to avoid going over engorged and potentially getting mastitis (infection of the milk duct). I started by dropping his 11pm feed to formula, then a few days later, replaced the 11am feed. I basically followed this trend of having a good gap between the feeds. At around seven weeks I was only breastfeeding at night and first thing in the morning purely so I didn’t need to get up from bed. I would happily have stayed doing this for a while longer, but my supply naturally started to deplete as Henry was starting to sleep through the night much longer. I also found that feeding off one side at a time, not both, really helped to keep my supply down and naturally reduce it whilst I weaned to formula. I was very lucky my engorgement was minimal, and leaking wasn’t too bad either – nothing a good breast pad couldn’t handle apart from at night. 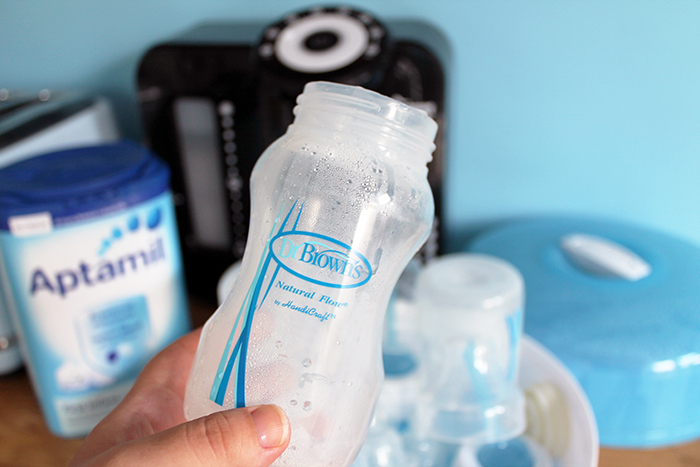 For the formula and bottles we use Aptamil Milk and Dr Brown’s bottles. 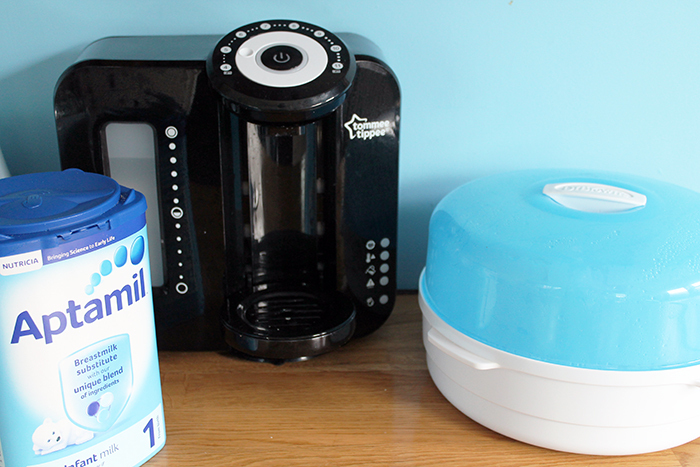 We also invested in the Tommee Tippee Perfect Prep Machine, which in all honesty is perfect!! It makes a bottle in two minutes at the right temperature and with no waiting around. It really does make life so much easier. Because we introduced a bottle at three weeks we never had an issue with feeding either. We also use the pre-made bottled formula for when we’re out and about which are life savers when you have a hungry child on your hands! One thing I found really great, which I know some mums won’t have experienced was the lovely support from the Southampton Health Visiting Team, particularly at my local Health Clinic sessions. I was discussing my plans and anxieties with one of the community nurses on a visit and she was so lovely. She didn’t put any pressure on me to keep going with breastfeeding and actually supported my decision and made me feel so much more positive. I was pretty happy with how things were progressing but it was nice to have a medical professional also agree and back me up. I’d also like to say that you never know where you will find support. My sister in law, and my friend (both called Sam) really helped me with great advice, and sharing their feeding stories, especially when I was at my lowest point. And the mummy bloggers community was invaluable – Sophia from Tattooed Tealady and Becka from In Real Life Channel were beacons of invaluable advice. So I’ll finish this really long blog post with a little message to any mum, or mum-to-be that ever wants to talk or needs some advice, please do contact me. Sometimes you just need a shoulder (physical or virtual) to cry on, and some friendly and impartial advice. Let me know your thoughts and stories in the comments below! The NHS promotes breastfeeding exclusively for a minimum of six months, and to continue feeding to one year with weaning to foods. Personally I believe that fed is best, rather than breast is best. Please do what you think is right for you and your baby. This post is aimed to provide a little advice. If you need additional support with breast or formula feeding, please talk to your Health Visitor or GP. All comments on this blog are moderated so please keep them kind – any rude comments will be deleted and not published – keep it polite! As a mother who loves to travel, I’d love to take Henry on a trip to Disneyland Paris someday. The trip won’t be cheap, but I’ve learned that I can buy or rent a Disney Vacation Club timeshare on the DVC Resale Market at a steeply discounted price.